J. Jesus Venegas, 80, of Cleveland, Texas passed away on Thursday, June 7, 2018. He was born on Sunday, July 25, 1937 in Jalisco, Mexico to Sixto Venegas and Maria Guadalupe, both of whom have preceded him in death. Left to cherish his memory is his loving wife Juana Venegas; children, Delfina Venegas, Concepcion Venegas, Victoria Venegas, Rosalio Venegas, Cirilo Venegas, Maria Venegas, Nicolasa Venegas, Juana Venegas, Cecilia Venegas, Anastacio Venegas, Alfonso Venegas; 64 grandchildren; along with numerous other loving family and treasured friends. 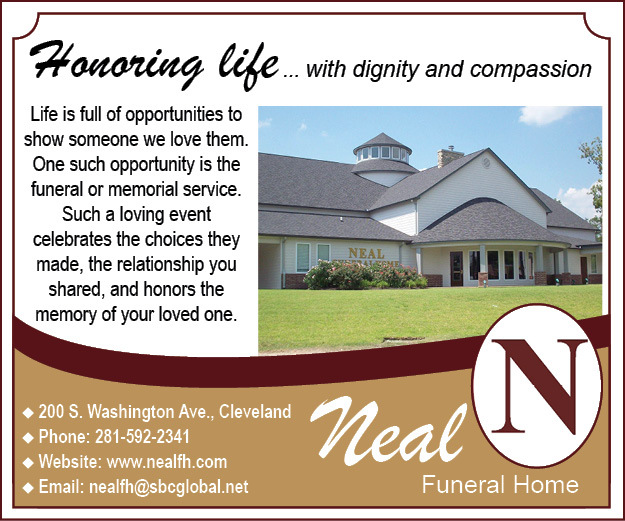 Visitation for Jesus will be held at Neal Funeral Home on Sunday, June 10, 2018 from 3:00 PM to 9:00 PM. Funeral Services will be held at Neal Funeral Home on Monday, June 11, 2018 at 6:30 PM. Interment for Jesus will immediately follow at Cleveland Memorial Cemetery. Leticia and Rolando Ramirez will be officiating.